Elk Grove Police reported possible gun shots fired at an accident scene shortly after 2:30 p.m. today. Officers are responding to a vehicle accident at Atkins Drive and White lock Parkway where there are reports of possible guns shots. EGPD will update as more information becomes available. Updated 5:46 p.m. Elk Grove Police have detained several people who are being questioned in the incident. The search for other suspects has finished. Updates on any arrests will be made tomorrow morning. Updated 5:00 p.m. Elk Grove Police have detained an unspecified number of people in connection to the investigation of the incident. 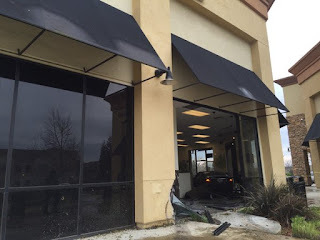 The car has been removed from the restaurant where the vehicle crash into. There have been no injuries reported. The investigation is on-going. Updated 4:18 p.m. Lock downs at area schools have been lifted. Officers have not located a victim or suspect. Several individuals detained nearby, their involvement is unknown at this time. Updated 3:17 p.m. Elk Grove Police report a car crashed into a building off Whitelock Parkway (see photo above) following a nearby shooting. The occupants fled the scene and police are currently tracking suspects. What do you expect when you build hundreds of units of low-income housing projects with many more to come? Brandon Cassious Claypool. Listed occupation: "Street entreprenuer"
I agree. That's why I moved out of that area. One of the was arrested for attempted murder and is back on the streets banging away. A gunman shot and wounded a woman and two 16-year-old girls during a fight at a party in East Franklin on Aug. 6. 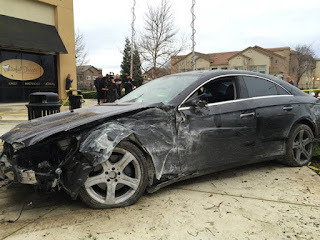 Elk Grove police arrested two suspects a few days later. Suspects Brandon Claypool, 19, and a 17-year-old boy who was not named by police were arrested on suspicion of attempted murder and additional charges of criminal street gang activity and conspiracy." Not every black person you see is "ghetto".. Why do you guys sterotype so much? @ the mall there were a group of white kids hollering for the whole mall to hear them, singing happy birthday.. But that's not ghetto right? Not every black person you see are consider ghetto..